The President this week cancelled his planned visit to Rwanda, received former vice president Nnamdi Sambo, American business magnate, Bill Gates and the freed Dapchi schoolgirls. He also got a blast from the past, with an aide of former President Goodluck Jonathan refuting claims by Vice President Osinbajo that they mismanaged funds. The week started with news of intense security for schools in Northeast part of the country. Troubled by a terrorist invasion of schools in the northeast, President Muhammadu Buhari had previously ordered the deployment of Nigerian Security and Civil Defense Corps (NSCDC) officials to secure secondary schools in the North. 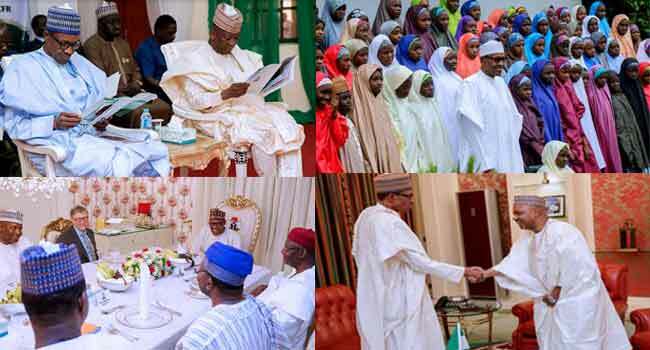 Buhari’s decision was spurred by the abduction of over 100 schoolgirls from the Government Girls Science Technical College (GGSTC) in Dapchi, Yobe State, about a month ago. They were however released on Wednesday, March 21. The Commandant General of the NSCDC, Mohammadu Abdullahi, in compliance with Buhari’s directive commenced the tour to provide adequate security for Northeast schools on Sunday. Also on Sunday, Buhari cancelled his trip to Kigali, Rwanda, where he was expected to attend the Extraordinary Summit of the African Union scheduled for March 21, 2018. The day ended with a retired military officer, Colonel Hassan Stan-Labo taking a swipe at President Buhari. Stan-Labo who spoke as a guest on Channels Television Programme, Sunday Politics said apart from visiting the state troubled by herdsmen attacks, Buhari should assume the role of Commander in Chief of the Federal Republic and sack Inspector General of Police, Ibrahim Idris, from office. Idris had previously flouted Buhari’s directive to relocate to Benue State due to incessant killings in Benue State. Also, to represent Buhari after the cancellation of his trip to Kigali, Rwanda, Foreign Affairs Minister, Geoffrey Onyeama was assigned to represent the country and to be supported by a Nigerian team. The day didn’t end without confirmation of the President Buhari’s nominees for the positions of Deputy Governors and members of the Monetary Policy Committee (MPC) of the Central Bank of Nigeria (CBN). The Senate Committee on Banking and Finance, on Monday, commenced the process of screening them. The nominees were made up of two Deputy Governors and four members of the Monetary Policy Committee. Tuesday commenced with President Buhari holding a closed-door meeting with Former Vice President, Namadi Sambo at the presidential villa in Abuja. Details of the meeting were not disclosed as Sambo left the presidential villa without responding to questions from journalists. Many Nigerians were left wondering what relationship the former VP was building with Buhari’s administration after the previous Jonathan-led administration exit after 2015 elections. In a delightful mood, Buhari churned out congratulatory messages to newly elected Russia President Vladimir Putin and German Chancellor, Angela Merkel. Buhari believes Putin’s success for the fourth time in the election is a testimony of the confidence Russians have in his leadership while he attributed Merkel’s victory to her hard work. Buhari’s administration, however, received a blast from the previous administration on Tuesday. Reno Omokri an aide to former President Goodluck Jonathan spoke out loud on Monday. He countered claims by Vice President Yemi Osinbajo, that the former President’s administration had shared about N150 billion before the 2015 elections. Omokri who was a guest on Channels Television’s Politics Today confidently took a swipe at Buhari’s administration. He said the Vice-President, Yemi Osinbajo lied! However, the National Chairman of the ruling All Progressives Congress (APC), Chief John Odigie-Oyegun was quick to silence critics of the Federal Government. He said despite the challenges experienced by the present administration it has still been able to deliver on its election promises, especially its campaign promise to fight corruption. WEDNESDAY: Dapchi Girls Are Back! Wednesday, 21st March 2018 went down as an unforgettable date in Nigeria’s history. The Federal Government confirmed the release of 104 schoolgirls abducted by Boko Haram terrorists. The girls were released on Wednesday after their abduction on February 19 from their school in Government Girls Science and Technical College, Dapchi, Yobe State. Mixed reactions trailed the return of schoolgirls with some Nigerians expressing great delight and others demanding more explanation on the ‘sudden return’ with no arrests made, despite the heavy security agents deployed to secure Yobe State after news of the attack. Few others called for the release of the over 200 schoolgirls abducted from the Chibok Secondary School in Chibok, Borno State in April 2014. Nigerians believe these girls deserve not to be forgotten by the Buhari-led administration. Excited by the news of the release of Dapchi schoolgirls, the All Progressives Congress (APC) said they are optimistic that the Federal Government will secure the release of the remaining Chibok girls abducted by Boko Haram terrorists in 2014. Due to Buhari’s refusal to go to Kigali, Rwanda. Nigeria was notably absent from the signatories as 44 African countries signed the agreement establishing a free trade area seen as vital to the continent’s economic development. The day ended with Buhari dining and wining with American Business magnate and Co-Founder of the Bill and Melinda Gates Foundation, Bill Gates to a dinner at the State House in Abuja. They were joined by Africa’s richest man, Aliko Dangote, and other top government officials. President Buhari visited Zamfara on Thursday. This is in continuation of his visit to states affected by herdsmen crisis. His first point of call was the Katsina Airport where he was received by the state Governor Aminu Bello and members of the executive council. He later left for Zamfara where he promised better security and directed security agencies to do all possible halt the killings and criminality in the country. The ever-supportive Vice President also seized the day to assure of the Federal Government’s effort to grow Nigeria’s economy. While delivering a speech on at the Expanded National Economic Council on Investment in Human Capital held in Abuja, he revealed that investing in people is primary to the Buhari-led administration. Bill Gate on Thursday challenged the Nigerian government to invest in human capital development. The founder of Microsoft believes this would lay a good foundation for the nation’s prosperity. Nigerian businessman, Aliko Dangote also joined voices with Gate, he called on the Federal Government to provide solutions to human capital challenges experienced in the country. The philanthropist also did not hold back words in criticising the Federal Government. He faulted part of the Economic Recovery and Growth Plan, saying the implementation of the ERGP is not at par with the needs of Nigerians. Responding to criticism from the main opposition Peoples Democratic Party (PDP), Buhari’s information minister fired back at the party for doubting the release of the Dapchi schoolgirls abducted by Boko Haram terrorists. PDP had earlier called on the UN to investigate the Federal Government for ‘scripting’ the abduction of the schoolgirls. Mohammad condemned the claim by the opposition, he said the PDP is “inhuman, insensitive, unpatriotic and unworthy party” for making such allegation against FG. Buhari didn’t go to bed on Thursday without assuring rescue of Dapchi schoolgirl Leah Sharibu, who is still Boko Haram terrorists’ den. “It is disheartening that one of the girls, Leah Sharibu, remains in captivity. Let me assure that I am as committed to her freedom as I was to the girls’ freedom when all 110 of them were in captivity. We will do everything in our power to bring Leah back safely,” Buhari tweeted.